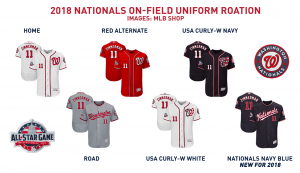 The Nats will return with the traditional home white uniform with blue and red trim, the iconic red Curly-W logo on the left chest and number on the right side. The gray road uniform remains the same with a script “Washington” across the front. The alternate uniform options grew by one this season, as an all-navy top joins the rotation with the “Nationals” script across the front. It made its debut at Winterfest this offseason. The uniform’s neck design mirrors the road uniform, avoiding a deeper cut like the rest of the home uniform options. It’s unclear if this will remain a permanent fixture within the uniform rotation, but it won’t replace any existing uniforms. It’s a welcome addition to see the script “Nationals” wordmark as an on-field option. A remaining feature in the alternate options is the return of the star-spangled Curly-W that the team has worn in navy-blue for several years along with a white version that was added last season. Additionally, the traditional alternate red uniform with a white Curly-W returns to the carousel of options. A special addition to this season’s uniforms is the official All-Star Game logo on the jersey’s right sleeve, which sits opposite the Nationals official logo. 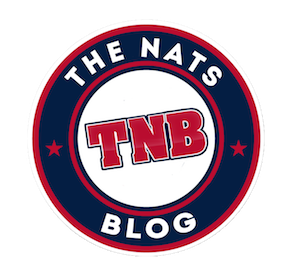 The Nats hat rotation remains unchanged this season with one minor footnote: The team added alternate caps for their patriotic jerseys last season, creating caps with a red top and blue bill in addition to its inverse with the star-spangled Curly-W logo in place of the traditional white Curly-W. The all-red home hat stays in place. The road hat will remain the blue top, red bill combination. The simple red alternate uniform will remain paired with the red top, blue bill cap. What remains uncertain is what will be worn with the new navy blue uniform. My guess is the road hat. Spring training has already given us a look at what the batting practice caps will be for the season, as MLB and New Era unveiled the “ProLight” caps. It’s essentially a different material with a non-embroidered team logo on the front and the MLB logo on the back. The caps are an exact mirror of the home caps, all red. As has become the tradition for the team who hosts the All-Star Game, all hats will be paired with the same full All-Star Game logo as is on the sleeve. This is a small change from what’s been done with teams in the past, as the simplified “ASG” logo is substituted for the full logo on these caps. 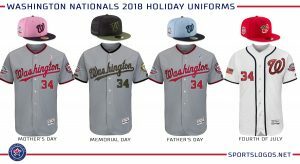 Memorial Day has become a regular in the MLB schedule for custom uniforms, this year is no exception as the league rolled out a uniform set like last season’s. The hats have an olive green brim and black camouflage top. Five stars are the right side to represent the branches of the United States military. The Memorial Day uniforms will be worn on May 26 – 28, 2018 on the road at Miami and Baltimore. July 4th uniforms are in a similar boat as the Memorial Day uniforms. The jerseys are like what was used last season, but the hats are noticeably different. 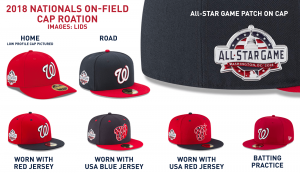 The Nats will don a simple all-red cap much like their home hat, except the curly-W is trimmed in gold and the National League logo is on the right side in place of the All-Star Game logo. The underside of the brim has some fancy artwork featuring the text “WE THE PEOPLE” from the Constitution in white underneath. It was always a curious choice to force the Nats and other teams who have an existing country or military themed uniform away from those options, however here we are anyway. The Fourth of July uniforms will be worn July 2 – 4, 2018 at home when Boston visits DC. Mother’s Day (May 13) and Father’s Day (June 17) are more recent additions, as the themed uniform elements return for the third year, but with no new jersey this time around. The caps are a variant of the pink or baby blue used in year’s past with darker shades of the same color family highlighting the Curly-W and brim. The All-Star Game logo patch is on these caps. Jackie Robinson day will come with some extra touches. All teams will continue the tradition of wearing No. 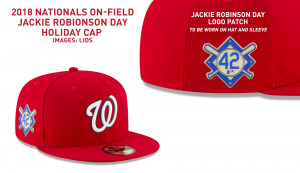 42, but now special Jackie Robinson Day patches will be added to their caps. Jackie Robinson Day is on April 15, when Colorado visits DC. All special holiday jerseys will come with special socks to match. Is MLB saving the best for last? The All-Star Game is a showcase of the host city and the host team. As of this post, we don’t know what they look like, but expectations are high as the midsummer classic comes to DC this July. The existing color pallet of the Nationals lends itself to MLB’s existing colors for its overall brand and the NL and AL. The challenge for Majestic and MLB is making these uniforms synonymous with Washington D.C. and the Nationals brand. 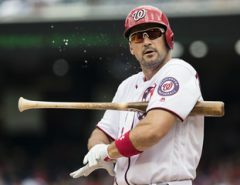 Pictures and information were found via MLB Shop, Lids.com, and Chris Creamer’s SportsLogos.net. Thanks for the uniform minutia. Good info for geeky fans like me. When it’s not a game when MLB dictates the uniform, who on the Nats org decides which uniform to wear? from a distance. Also the stars and stripes W on the white jersey fades off from a distance and appears as a very weak curly W because of all the white in it. These would be OK if worn only on July 4th. We are now wearing these uniforms almost exclusively at home. Weekdays and weekends. This is flat out wrong. the Senators teams of the late 60’s early 70’s, who wore the very same all red hats. Now we rarely see them at home with the exception of the red helmets. With the addition of the ASG jersey worn on Tuesdays, there is no room for our regular uniforms. I like the ASG jersey with the nationals script and red numbers, it is a good look. What we should do is get rid of the patriotic white ones and the non-functional patriotic red caps and return to our classic home whites with the all red cap and red curly W and bring back the red jersey and alternate red cap with blue bill for Saturday games. and jerseys in their home parks and Nationals have to wear American flags all over our uniforms. To wear them this much is overdoing the patriotic aspects of playing in the nation’s capital. The fact that our uniforms are red, white and navy blue says it all about our patriotism. Having flag patterns themselves on your uniforms is overstated and gives our uniforms a minor league look. Major league players should have a classic big league look like we used to wear most of the time here. Bring back the official uniforms please!